Linett Bledsoe, center, with, from left, James Duehning, Baptist Village of OKC assistant campus director; Pierce; Thomas; and Martin Hall, Baptist Village of OKC campus director. Baptist Village Communities (BVC) is a regular award recipient of LeadingAge Oklahoma, the Oklahoma state association of not-for-profit senior living organizations. This year was no different, as BVC took home three awards, more than any other organization in Oklahoma. 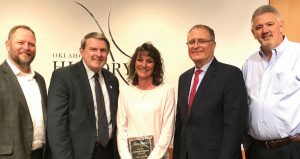 Baptist Village of Hugo’s Annie Wickson was named environmental employee of the year. 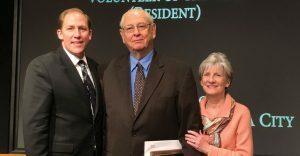 Baptist Village of Oklahoma City boasted two honorees. Ben Lacy was named resident volunteer of the year, while Linett Bledsoe was honored as direct care employee of the year. Wickson has served on the Baptist Village of Hugo Friends Team since 1984. 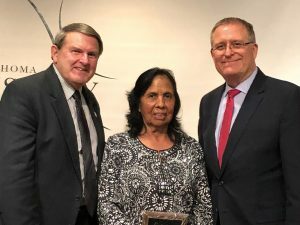 Through the years, she has influenced thousands of people and ministered to residents and their families through the environmental services team. She is a mentor and trainer assigned to new Friends Team members. She guides new Friends Team members and patiently instructs them in the proper way to do the job, while serving residents and their families. Ben Lacy moved to Baptist Village of Oklahoma City in 2015. He wasted no time getting plugged into service. Lacy’s background as a school principal and bi-vocational minister meant he was already familiar with a life of service. While visiting guests in the Rehab Neighborhoods, Lacy noticed that families of guests could use calming reassurance and a listening ear. He was asked to organize a Volunteer Rehab Greeter Program. Not only does Lacy oversee a team of 45 volunteers, he also recruits and leads orientation for all resident volunteers. Linett Bledsoe began serving at Baptist Village of Oklahoma City in 2000 as a certified nursing assistant (CNA). Her determination and devotion led her on a successful career path, which has included advanced certified medication assistant, restorative aide, supply coordinator and more. Annie Wickson, center, with BVC President Bill Pierce, left and BVC Vice President-Operations Steve Thomas. Bledsoe has purchased items with her own money for residents in need of clothing or other necessities. She gives without expecting anything in return. She brings her generous spirit and fun-loving attitude to all interactions with residents. She goes the extra mile without complaint and won’t back down from a challenge. Annie Wickson, Ben Lacy and Linett Bledsoe are just three more examples in BVC’s long tradition of outstanding service. This passion is carried out daily to more than 2,300 residents, clients and guests.